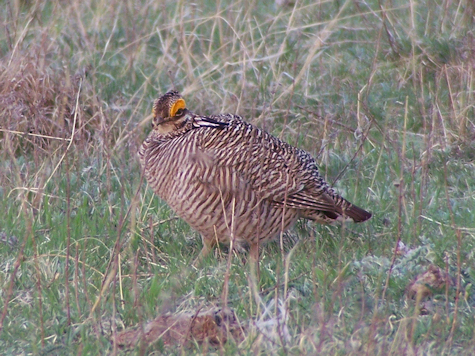 Prairie Chickens seen at Lake Abilene? Larry Millar has received a report of Prairie Chicken sp. being seen at Lake Abilene yesterday. No other details, but Larry says the person is a reliable source. This is a Lesser Prairie Chicken, it may look similar to it. If you see them, please call our hotline and/or notify Abilene SP officials. 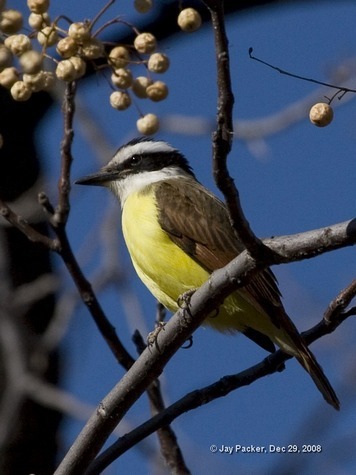 The Great Kiskadee (Pitangus sulphuratusis) a large (8.8 in. long, weight 2.2 oz.) tyrant flycatcher. It breeds in open woodlands with some tall trees, including cultivation and around human habitation, from southern Texas and Mexico to Uruguay and central Argentina, and on to Trinidad. An adult Great Kiskadee has a stout black bill. The head is black with a strong white stripe above the eye and with a white chin, and with a concealed yellow crown stripe. The bird “reveals” this yellow crown stripe to look like a crest when challenging or when courting. The wings, back and tail are brown with strong rufous fringes. Its flashy bright yellow belly and shrill, exuberant call (kis-ter-DEE) along with the head and body colors make the Great Kiskadee easy to identify. The nest, built by both sexes, usually in a tree or on a telephone pole, is a shaggy ball of twigs with a carefully constructed smooth round side entrance and smooth nest cup. The typical clutch is two to three cream eggs lightly blotched with reddish brown. They are incubated by the female. Both parents feed the babies. ALERT: Be on the lookout for the TRUE sign that spring is here– a sighting of The Scissor-tailed Flycatcher. How exciting that will be!